Monkey brain scans have revealed new information about the brain structure that processes visual information. The findings were recently presented in PNAS by neurophysiologists Qi Qhu (KU Leuven) and Wim Vanduffel (KU Leuven/ Harvard Medical School). When the brain receives visual signals from the eyes, it processes them in a strictly hierarchical way. Specific parts of the visual field are projected onto specific parts of the cortex through the retina. 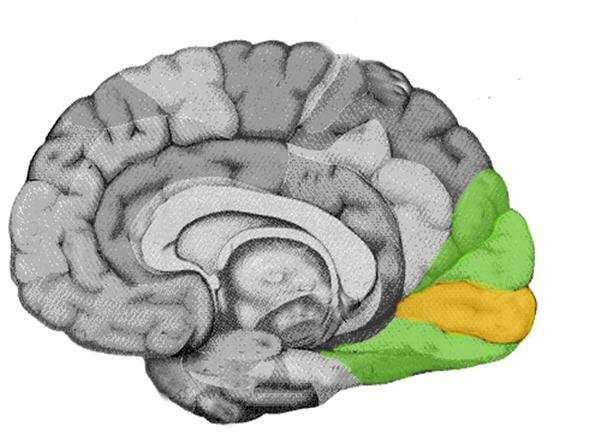 Points that are close together in the visual field are also processed by neighbouring neurons in the visual cortex. This strategy ensures an accurate representation of the visual field in the cortex. This kind of representation is also repeated multiple times within the hierarchical visual system. First, brain cells make literal maps of visual information called retinotopic maps. These maps are slightly deformed, just as a world map is never a perfect representation of a globe. Central vision, for example, is processed in much greater detail than peripheral vision, a difference that the maps reflect. Regions at lower hierarchical levels feed information from the retinotopic maps to higher levels and vice versa, interpreting what is being seen. So to understand vision, it's extremely important to identify and precisely locate all these retinotopic maps within the visual cortex. Previously, knowledge on the retinotopic maps was based on research with animals such as primates, explains Professor Wim Vanduffel from KU Leuven and Harvard Medical School. "Researchers observed profound differences between monkeys from the Old World—mostly from Africa and Asia—and the New World, the Americas. Moreover, textbooks state that our early visual cortex consists of adjacent parallel bands, just like in rhesus monkeys. Therefore, researchers believe that the human visual cortex is more similar to that of Old World monkeys." However, novel technologies have allowed researchers to fine-tune this view. Vanduffel says, "In our study, we used functional magnetic resonance imaging. With these scans, we can measure the activity in brain regions activated during specific tasks—for example, a monkey staring at a screen while only a small part of the visual field is stimulated. The technology has been around for a long time, but we considerably improved the spatial resolution, down to about 0.5 mm. This improvement allowed us to scan the entire visual cortex of individual monkeys in the greatest detail, which was impossible with older fMRI and electrophysiological methods." The study showed that the areas at the lowest levels of the visual cortices of Old World monkeys are not arranged in adjacent parallel bands. Vanduffel says, "Instead, these areas show a more complex topographic organisation. Surprisingly enough, however, this organisation is similar to the one previously observed in monkeys from the New World. In other words, just as geographic maps become more accurate over time, we have to adjust our knowledge on the topographic organisation of the visual cortex." "These improved maps will allow us to navigate the brain more precisely. It's possible that the visual cortex of humans is organised similarly, but this requires further research with stronger and better MRI scanners."